Tecvac Ltd of Cambridge, part of the Wallwork Heat Treatment (WHT) Group, has designed and built a unique, world class surface engineering research machine for The University of Sheffield as part of a £500,000 EPSRC project. Specifically designed for the Research Centre in Surface Engineering, led by Professor Allan Matthews (in the Department of Materials Science and Engineering) the new Tecvac IP70 machine uniquely combines two different Physical Vapour Deposition (PVD) coating technologies in a single production scale vacuum chamber. Funded by the Engineering and Physical Sciences Research Council (EPSRC), it will be used both for fundamental research and for near-market applications in surface engineering, covering a range of ceramics, nano composite and glassy-metal plasma-based coatings - combined with a duplex substrate diffusion pre-treatment capability. This will open up routes to new thin film and nano-scale processes which can support innovative medical and life science applications including tissue engineering. Projects using the new facility could include new types of anti-microbial coatings for Class 2 and Class 3 medical devices, surgeons' tools and operating theatre hardware, extended super long life implants such as knee and hip replacement prostheses and other highly wear resistant or lubricious applications throughout biotechnology The unique design of the new facility allows new coatings to be designed with fully controlled multiple and smoothly graded properties to ensure compatibility with metals and ceramics and other advanced bio-mimetic materials as well as with human and mammal tissues. A major long-term potential benefit is that these multi-property, and multi-functional, long-life coatings will support the development of devices and prostheses which can have lifetimes exceeding a normal human lifespan thus avoiding multiple and expensive revision surgery and related long-term patient trauma. The highly-modified IP70 equipment design built to specifications developed by Prof. Matthews and his colleague, Dr. Adrian Leyland, allows research to be conducted on multiple layer surface coatings. It allows the research team to combine the use of electron beams and magnetrons in a single process to create complex coatings with ceramic, metal and carbon based constituents in an industrial scale environment. This in turn, allows coatings to be applied sequentially with a variety of elemental metals, ceramics such as titanium nitride and carbon based coatings if required. Users can have a choice of process atmospheres with combinations of reactive or inert gases such as oxygen, nitrogen or argon depending on the research objectives. The design includes, for example, twin magnetrons, twin electron beam assemblies, a mass spectrometer and allied process controls, operating systems, data logging and display facilities. This retains freedom for the research team to plan, modify and apply all critical parameters of the coating process, while ensuring safety and process integrity. "It opens up exciting areas of research for us," commented Prof. Matthews. "We can now support a number of advanced projects far more effectively and further develop our materials property based approach to tribology, and design coatings for optimal ratios of elastic modulus and hardness. This will lead eventually to improvements in many engineering sectors, extending to aerospace, power generation equipment and medical devices. For example the IP70 also allows leading edge work on material grain size and orientation at the nano level - a critical feature in the design of long life biomechanical devices such as replacement knee and hip joints." 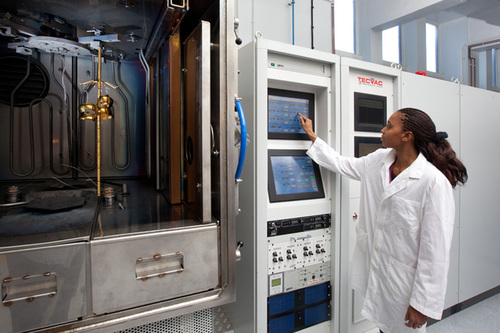 The ability to combine different types of PVD coating processes in the research machine is also expected to lead to much lower application temperatures for ceramic and other high performance coatings. In due course this is expected to lead to many new applications in medical, as well as aerospace and power generation products. Tecvac provides ultra hard coating, heat treatment and vacuum brazing services from a custom built site near Cambridge, builds commercial and research PVD coating machines, and supports other novel applications of specialist vacuum equipment for customers world-wide. Tecvac surface engineering plant is installed in businesses and research facilities in more than 20 countries. Media release issued on behalf of Tecvac Ltd. This press release was distributed by ResponseSource Press Release Wire on behalf of CMPR in the following categories: Education & Human Resources, Medical & Pharmaceutical, Manufacturing, Engineering & Energy, for more information visit https://pressreleasewire.responsesource.com/about.